Universal's Islands of Adventure (commonly known as Islands of Adventure, and Universal Studios Islands of Adventure) is a theme park in Orlando, Florida. It opened on May 28, 1999, along with CityWalk, as part of an expansion that converted Universal Studios Florida into the Universal Orlando Resort. The slogan for this theme park, along with Universal Studios Florida, is Vacation Like You Mean It, introduced in 2013 as Universal Orlando Resort. Like Universal Studios Florida next door, Islands of Adventure has not limited itself to Universal's own library. Except The Lost Continent, Port of Entry, Jurassic Park, and Skull Island, the remaining park areas are based on characters licensed from rival studios, many of whom did not own theme parks of their own. Some of these include Seuss Landing (Dr. Seuss Enterprises), Toon Lagoon (Jay Ward Productions and Paramount Pictures), and Marvel Super Hero Island (Marvel Entertainment). During the construction of the park, Universal opened a Preview Center (known as the Islands of Adventure Preview Center) at adjacent Universal Studios Florida. Opening two years before the new theme park, the Preview Center was designed to give guests a sneak peek at some of the themes and attractions for Islands of Adventure. The attraction was located in the Paradise Theater building located in the New York section of Universal Studios Florida, next to the Kongfrontation attraction. In the attraction, guests would walk through various rooms themed to the various "Islands" in the new park. The final room stated when the Islands of Adventure park would open, and showed guests Universal's future plans for the Universal Orlando Resort. The Preview Center was closed shortly after the opening of Islands of Adventure. 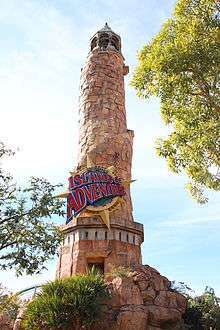 Islands of Adventure had a soft opening beginning March 27, 1999, during which visitors could preview the park at a discounted price while the staff conducted a technical rehearsal and worked on the "finishing touches." During this soft opening, guests were informed that attractions might open and close throughout the day without notice and that some attractions might not be open at all. Initial plans were to open the park in mid-May, but this was ultimately delayed until May 28, 1999. After the enormous capital expenditure required to build Islands of Adventure, CityWalk, and the resort hotels, Universal sought to overtake nearby Walt Disney World in attendance. However, with the addition of the second park, new resorts, and entertainment district, the resort was named Universal Studios Escape. Essentially, it seemed that visitors were confused by the name, assuming that Islands of Adventure was a new area added to the already-existing Universal Studios Florida theme park. For the first two years, attendance did not rise as expected. By 2001, the marketing was revamped, clarifying that Islands of Adventure was indeed a second, completely separate park with new rides and attractions. Universal Studios Escape was renamed Universal Orlando Resort, and ended up being the only resort in the Orlando area to actually have an increase in attendance after the September 11 attacks on the United States. Despite this, the attendance of the resort failed to surpass the attendance of the Walt Disney World resort. The first concepts for the Islands of Adventure park are conceived by MCA Recreation Services. Known as "Cartoon World" designed by Universal Parks & Resorts co-founder Robert Ward, the park would feature rides and attractions based on DC Comics, Dr. Seuss, and Warner Bros..
Universal releases the blockbuster film Jurassic Park on June. Its success resulted in a Jurassic Park attraction opening in Hollywood followed by the second version at Islands of Adventure when that park opened. On September 16, Universal announces plans to add a second theme park and several resorts at its Florida complex. Construction finally begins on Islands of Adventure. Shortly after, the Islands of Adventure Preview Center opened at the adjacent Universal Studios Florida, replacing The Screen Test Home Video Adventure. It allowed guests to preview all six original islands at Islands of Adventure and their rides and attractions within. The Preview Center also included Universal's plans for an expansion into Universal Orlando Resort. Flying Unicorn and Storm Force Accelatron debut in the park's The Lost Continent and Marvel Super Hero Island areas, on May and June 29, respectively. The annual GrinchMas event begins in the park's Seuss Landing area and in Universal Studios Florida in December. Universal's Halloween Horror Nights event is held for the first time ever at Islands of Adventure on October. Each "island" is transformed into a different twisted world: Port of Entry into Port of Evil, Seuss Landing into Boo-Ville, The Lost Continent into Island of Evil Souls, Jurassic Park into JP Extinction, Toon Lagoon into Treaks and Foons, and Marvel Super Hero Island into Island Under Siege. Sylvester McMonkey McBean's Very Unusual Driving Machines is rebuilt into a new concept and officially opened as The High in the Sky Seuss Trolley Train Ride in June. Universal Studios and Warner Bros. officially announce on May 31, the seventh island at Islands of Adventure, The Wizarding World of Harry Potter, at a joint press conference with an expected opening of late 2009 or early 2010. Flying Unicorn and the Enchanted Oak Tavern closed on July 7 to be replaced by The Wizarding World of Harry Potter. Universal officially reveals the Wizarding World's attractions on September 16, including Zonko's, Honeydukes, Owl Post, Dervish and Banges, Ollivander's Wand Shop Experience, Frog Choir, Triwizard Spirit Rally, Harry Potter and the Forbidden Journey, Filch's Emporium of Confiscated Goods, and Dragon Challenge and Flight of the Hippogriff, which will replace the Dueling Dragons and Flying Unicorn rides. Oh, The Stories You'll Hear! opens on October in the park's Seuss Landing area. Mat Hoffman's Aggro Circus debuts on March in the park's Toon Lagoon amphitheatre, the theater's first show since Mat Hoffman's Freakin Crazy Stunt Show in 2002. Dueling Dragons is closed for its final transformation into the Dragon Challenge on May 5. Ice is renamed Hungarian Horntail and Fire is renamed Chinese Fireball. The Wizarding World of Harry Potter begins soft openings for the general public on June 1. The Wizarding World of Harry Potter's grand opening ceremony took place on June 16 with book series author J. K. Rowling and film series actors Daniel Radcliffe, Rupert Grint, Emma Watson, Michael Gambon, Warwick Davis, Tom Felton, Matthew Lewis, James and Oliver Phelps and Bonnie Wright attending. John Williams conducted the Orlando Philharmonic Orchestra into many songs of the first film's score, including the film series' prologue, which he composed. The seventh island, The Wizarding World of Harry Potter, officially opened on June 18. The area is Islands of Adventure's biggest investment since the park's opening. After five years, Triceratops Discovery Trail is finally reopened to the public for a limited time on December 13, speculated to further remain seasonal during peak season. One of the roofs on Dudley Do-Right's Ripsaw Falls catches fire on January 1, causing immediate evacuation of the ride. The ride resumed normal operations on March 3, 2011. Universal announces a major refurbishment of The Amazing Adventures of Spider-Man ride on May 19, with plans to re-master the ride film in High-definition as well as to update the ride's technical system and to replace all of the projectors with new 3-D digital projectors. The Amazing Adventures of Spider-Man re-opens after refurbishment. A Celebration of Harry Potter, an annual three-day weekend event celebrated on the last weekend of January, debuts at both Universal Studios Florida and Islands of Adventure on January 24. The Hogwarts Express Hogsmeade station opens on July 1 as well as the King's Cross station at Universal Studios Florida, connecting park visitors to both Harry Potter theme parks via a full-scale replica of the train that appears in the Harry Potter film series. Dr. Seuss's ABC opens on August 24 with 26 big blocks with the letters of the English alphabets in the outdoor playground. Skull Island: Reign of Kong is announced on May 6 as a new land/attraction based on the 2005 film King Kong, opening in the summer of 2016. On May 7, Universal announces a partnership with Nintendo to bring their characters to either Universal Studios Florida or Islands of Adventure park. Raptor Encounter meet & greet attraction officially debuts on May 22. The Incredible Hulk roller coaster closes on September 8 to undergo refurbishment. The Incredible Hulk's refurbishment is completed early April with the placement of the final track piece, and on May 9, Universal revealed new changes to the coaster, which includes a new track, story line, ride vehicle and entrance. Without any press release, Skull Island: Reign of Kong officially opens as the eighth island of Islands of Adventure on July 13. The Incredible Hulk reopened on August 4. Islands of Adventure consists of eight themed "islands", the majority of which are based on licensed intellectual properties, with only two lands based on original Universal Studios works. They are, in clockwise order from entry: Port of Entry, Marvel Super Hero Island, Toon Lagoon, Skull Island, Jurassic Park, The Wizarding World of Harry Potter, The Lost Continent, and Seuss Landing. Marvel Super Hero Island is based on the superhero characters featured in Marvel Comics. The area is notable for its comic-book styled architecture; many of the building interiors are created in what could be considered comic book perspective, with exaggerated lines and angles. Meanwhile, many exteriors are painted in a special paint which appears to change color based on the angle from which it is viewed – sometimes purple, sometimes orange. Perhaps most notably, the buildings are all labelled generically, as one would expect the buildings in the background of a comic panel to be: "Store," "Shop," "Food," and "Comics," instead of detailed names and logos. The area is home to a variety of dining outlets and merchandise shops. Food and beverage items can be purchased from Cafe 4 and Captain America Diner. Merchandise items can be bought from a variety of themed stores including Spider-Man Shop (The Amazing Adventures of Spider-Man), Marvel Alterniverse Store, Comic Book Shop, and Oakley. The Incredible Hulk confronts guests as they enter the area with an attention-grabbing roar. 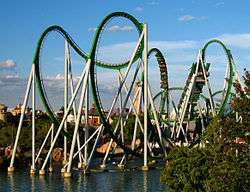 Hulk is a high speed launched steel roller coaster which has a top speed of 65 miles per hour (105 km/h). It closed on September 8, 2015 for major refurbishments and reopened in Summer 2016. Storm Force Accelatron is a teacups ride themed after X-Men. Doctor Doom's Fearfall is a pair of S&S Power Space Shot attractions themed after the Fantastic Four. The Amazing Adventures of Spider-Man is a 3-D simulator ride based on the character Spider-Man. The ride is set in New York as Spider-Man prevents The Sinister Syndicate from taking the Statue of Liberty. Meet Spider-Man and the Marvel Super Heroes is a meet-and-greet attraction, where guests can meet superheroes including Wolverine, Storm, Cyclops and Rogue, Spider-Man and Captain America. In late 2009, The Walt Disney Company (Universal's biggest competitor in the theme park market) announced that it had sought to acquire Marvel Entertainment. Universal announced that Marvel's new ownership would not affect Marvel Super Hero Island, and Disney CEO Bob Iger acknowledged that Disney would continue to honor any contracts that Marvel currently has with Disney competitors. In March 2012, Iger revealed that Disney had begun preliminary concepts of incorporating Marvel's properties into their parks, although no major negotiations with Universal were announced. Hong Kong Disneyland has since announced an expansion to its park featuring characters from the Marvel Universe. Disneyland in California has also since incorporated meet-and-greet Marvel characters into the park and an Avengers Super Hero Half Marathon Weekend. Only Walt Disney World and Tokyo Disney are barred from having Marvel characters in its parks, due to contractual obligations to Universal and Universal's use of Marvel characters in the region. However, this only includes characters Universal is currently using, other characters in their "families" (Spider-Man, X-Men, Avengers, Fantastic Four, etc. ), the villains associated with said characters, and the Marvel name. This clause has allowed Walt Disney World to have meet and greets, merchandise, attractions and more with other Marvel characters not associated with the characters at Islands of Adventure, such as Star-Lord and Gamora from Guardians of the Galaxy. Toon Lagoon is based on the comic strip characters of King Features Syndicate and Jay Ward. The area focuses on water-based rides (hence the name) and features 3 counter-service restaurants. Toon Lagoon features three main attractions. Dudley Do-Right's Ripsaw Falls is a traditional log flume combined with roller coaster track based on the Dudley Do-Right character. Popeye and Bluto's Bilge-Rat Barges is a river rafting water ride themed after Popeye the Sailor saving Olive Oyl from Bluto. Me Ship, the Olive is a kids' playground built in and around Popeye's ship. The three levels of the ship all contain a variety of interactive elements including cannons and hoses which can further soak riders on the Popeye and Bluto's Bilge-Rat Barges ride. Mat Hoffman's Aggro Circus is a live seasonal BMX stunt show at the Toon Lagoon Theater which operates during spring break and summer. Skull Island is the most recently opened island at the theme park. The area is based on the 2005 film King Kong, directed by Peter Jackson, and the 1976 film King Kong. The area's sole attraction, Skull Island: Reign of Kong, opened on July 13, 2016. This attraction and island marks the return of the King Kong character to the Universal Orlando Resort, after the Kongfrontation attraction closed at Universal Studios Florida in 2002. Jurassic Park is themed to the film series of the same name. Set after the events of the first film, the area undertakes the guise of the John Hammond's dinosaur theme park featured in the series. As such, the area is filled with the attractions and exhibits one would find in the "real" Jurassic Park, including thrill rides and discovery-based exhibits. Jurassic Park features five main attractions. Jurassic Park River Adventure, constructed by Superior Rigging & Erection, is a water ride based on Steven Spielberg's first film and Michael Crichton's novel. Triceratops Discovery Trail (formerly Triceratops Encounter) is a walkthrough attraction where guests can get up close and interact with a full-scale animated replica of a Triceratops, while a "veterinary technician" performs a semi-annual exam on the Trike. The attraction actually features three different Trikes – Topper, Chris, and Cera. All 3 are female. Chris was named after a member of the team that created the dinosaurs who died before the attraction opened. Spar Aerospace (now known as MD Robotics) was contracted to construct the three robotic trikes, each of which are 9 metres (30 ft) long and 3 metres (9.8 ft) high. Universal requested specific requirements for the robots including the ability to replicate breathing (through synchronised rib cage movements), sneezing, snorting, urinating and flatulating. Due to maintenance and staffing issues, the trail was closed off in 2005. However, after five years, the attraction reopened in December 2010 for seasonal operation. Pteranodon Flyers is a steel suspended roller coaster manufactured by Setpoint USA. Riders join the queue located within Camp Jurassic. Pteranodon Flyers features three two-seater cars suspended on a track. The cars are pulled up a hill and then travel a circuit around Camp Jurassic at low speed before returning to the station. Due to the low capacity of the ride, only those who are between 36 and 56 inches (91 and 140 cm) or those with a child of that height may ride. The Universal Express pass cannot be used on this attraction due to the ride's low capacity. A similar ride, Canopy Flyer exists at Universal Studios Singapore. The Wizarding World of Harry Potter - Hogsmeade is themed around the Harry Potter universe, authored by J. K. Rowling. It officially opened to the public on June 18, 2010. On May 31, 2007, Universal announced that it had secured the licensing rights from Warner Bros. and Rowling to incorporate the Harry Potter franchise to Islands of Adventure. The 20-acre (81,000 m2) island features attractions, shops and restaurants set inside such locations as the Forbidden Forest, Hogsmeade Village and the iconic Hogwarts Castle. Ground breaking began in 2007, with the official opening scheduled for June 18, 2010, as announced on March 25, 2010. As part of the promotion for the then-upcoming area, a behind-the-scenes documentary on production of the park section is included on the Blu-ray and DVD release of Harry Potter and the Half-Blood Prince. In the Wizarding World of Harry Potter there are five main attractions. 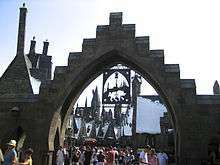 Harry Potter and the Forbidden Journey, the section's signature attraction, is located inside Hogwarts Castle and takes guests through scenes inspired by the Potter books and films. Dragon Challenge, previously known as Dueling Dragons, is a pair of intertwined inverted roller coasters. Flight of the Hippogriff, previously known as Flying Unicorn, is a Vekoma junior roller coaster. The Hogwarts Express is a train ride that transports visitors between Hogsmeade in Islands of Adventure and Diagon Alley in Universal Studios Florida. An expansion of the Wizarding World of Harry Potter, based on the Diagon Alley and London settings from the series, opened on July 8, 2014 at the adjacent Universal Studios Florida park in the former site of the park's Jaws attraction. The Hogwarts Express attraction connects the two areas of the Wizarding World of Harry Potter in each park. The Lost Continent is themed to ancient myths and legends, and is divided into two sub-sections; an ancient Arabian marketplace called Sinbad's Bazzaar, and a Grecian-Atlantis-esque Lost City. Formerly, the Lost Continent included a medieval section Merlinwood, but the majority of that area was re-themed for the Wizarding World of Harry Potter. Today the area contains two live-action shows. This land is also home to Mythos, which is one of two full-service restaurants in the park and was voted winner of best theme park restaurant by Theme Park Insider for six successive years between 2003 and 2008. There are three main attractions in the Lost Continent. The Eighth Voyage of Sinbad is a live-action stunt show located in the ancient Arabia section. In front of this show is The Mystic Fountain that entertains and interacts with guests. Seuss Landing is based on the works of author Dr. Seuss. The island features several Seuss-themed attractions, especially geared towards small children, as well as a Green Eggs and Ham Cafe and Circus McGurkus restaurant. As in the books, one of the unique characteristics of this area is that there is not a single straight line anywhere. Palm trees bent by the winds of Hurricane Andrew were even planted in the area to continue this theme. Seuss Landing includes six attractions inspired by Dr. Seuss' books. The Cat in the Hat is a dark ride that takes guests through the Dr. Seuss story of the same name. The High in the Sky Seuss Trolley Train Ride is a twin-tracked tour above and around Seuss Landing. One Fish Two Fish Red Fish Blue Fish is a spinning ride with a musical riddle that will help riders escape water-spitting fish. Caro-Seuss-el is a Seuss themed carousel. Oh, The Stories You'll Hear is a stage show based on the Dr. Seuss books and characters. If I Ran the Zoo is an interactive play zone for kids. Several attractions in Islands of Adventure allow guests to utilize Express Pass. This pass admits users to a separate line for the attraction, which is given priority status when boarding. Express Pass is not a virtual queuing service. Instead, passholders may enter the "Universal Express" line whenever they wish. The price of this pass is not included in the charge for park admission. ↑ "NBCUniversal completes takeover of Universal Orlando theme parks". Los Angeles Times. July 1, 2011. Retrieved 2011-07-11. ↑ "Islands of Adventure". Universal Orlando Archives. The Florida Project. Retrieved January 17, 2013. ↑ The Rough Guide to Florida Stephen Keeling, Sarah Hull, Rebecca Strauss - 20150241238064 - ".At Islands of Adventure there's one live ..."
1 2 3 "TEA/AECOM 2013 Global Attractions Report" (PDF). Themed Entertainment Association. 2014. Retrieved June 6, 2014. ↑ Directory of major malls. MJJTM Publications Corp. 1990. p. 811. ↑ Jackson, Jerry (May 1, 1990). "Major Bows Out of Galleria Plan Entertainment To Be New Theme". The Orlando Sentinel. Retrieved March 23, 2013. ↑ futureboy107. "Islands of adventure Preview Center". Video. YouTube. Retrieved July 11, 2010. ↑ "Universal To Offer Soft Opening For Islands of Adventure". March 23, 1999. Retrieved July 10, 2009. ↑ "Islands of Adventure Technical Rehearsal May Continue". May 4, 1999. Retrieved July 10, 2009. ↑ "Islands of Adventure Announces Grand Opening Date". May 13, 1999. Retrieved July 10, 2009. ↑ "Universal Orlando Resort History". ↑ Schneider, Mike (July 5, 1998). "Theme Parks Set in Motion Around Conference Tables". Lakeland Ledger. Retrieved April 13, 2011. 1 2 "COMPANY NEWS; Universal to Expand Park in Florida". New York Times. September 16, 1993. Retrieved April 13, 2011. ↑ Cronan, Carl (September 15, 1997). "Disney Finds Another Way To Keep Visitors Entertained". The Tuscaloosa News. Retrieved April 13, 2011. ↑ "Islands Park to Debut May 28". Lakeland Ledger. May 12, 1999. Retrieved April 13, 2011. ↑ MacDonald, Brady (May 19, 2011). "Universal Studios Orlando plans 'Despicable Me' attraction and digital upgrade to Spider-Man ride in 2012". Los Angeles Times. ↑ "Skull Island: Reign of Kong Coming to Universal Orlando in 2016". ComingSoon.net. ↑ Orlando Sentinel (May 22, 2015). "Universal adds Raptor Encounter at Islands of Adventure - Orlando Sentinel". OrlandoSentinel.com. ↑ "Storm Force Accelatron (Islands of Adventure)". Parkz. Retrieved April 25, 2011. ↑ Brady McDonald (August 31, 2009). "How the Disney-Marvel deal affects Universal Studios theme parks" (PDF). The Los Angeles Times. Retrieved August 31, 2009. ↑ "Marvel Agreement between MCA Inc. and Marvel Entertainment Group". sec.gov. U.S. Securities and Exchange Commission. ↑ "Services". Superior Rigging & Erection Company. Retrieved March 24, 2013. ↑ Dean, Bill (May 21, 1999). "With opening, complex now rivals Disney". Ocala Star-Banner. Retrieved April 13, 2011. 1 2 Garcia, Jason; Clarke, Sara K. (December 19, 2010). "Universal dusts off IOA Triceratops". Orlando Sentinel. Retrieved April 13, 2011. ↑ Goldiner, Dave (June 22, 2001). "Coupon Kids Heading Home From Fla.". NY Daily News. New York. Retrieved April 14, 2011. 1 2 "Jurassic Park – Triceratops Encounter". Islands of Adventure. July 12, 2004. Retrieved April 14, 2011. ↑ Lewis, Peter H. (May 6, 1999). "Terrifying Precision, Just for Fun". New York Times. Retrieved April 14, 2011. ↑ Fazekas, Andrew (December 3, 2004). "Attack of the Dinobots". American Association for the Advancement of Science. Retrieved April 14, 2011. 1 2 Marden, Duane. "Pteranodon Flyers (Islands of Adventure)". Roller Coaster DataBase. Retrieved April 11, 2011. ↑ "Pteranodon Flyers (Islands of Adventure)". Parkz. Retrieved April 11, 2011. ↑ "A Reservations System For Universal Orlando". New York Times. May 20, 2001. Retrieved April 13, 2011. ↑ "Hotel guests get free cuts in line". Toledo Blade. December 17, 2000. Retrieved April 13, 2011. ↑ Marden, Duane. "Canopy Flyer (Universal Studios Singapore)". Roller Coaster DataBase. Retrieved April 14, 2011. ↑ "Camp Jurassic (Islands of Adventure)". Parkz. Retrieved April 11, 2011. ↑ Majendie, Paul (May 31, 2007). "All aboard for the Harry Potter rollercoaster". Reuters. Archived from the original on June 2, 2007. Retrieved May 31, 2007. ↑ "A First Look at the Wizarding World of Harry Potter™". Archived from the original on September 22, 2009. 1 2 3 Travis Reed (September 15, 2009). "Universal reveals details of new Harry Potter park". Associated Press. Retrieved September 15, 2009. ↑ "Seuss Landing". Universal Orlando. Retrieved November 25, 2012. ↑ "Cat in the Hat Ride". Universal Orlando Resort. Retrieved July 11, 2009. ↑ "TEA/AECOM 2008 Global Attractions Report" (PDF). Themed Entertainment Association. 2008. Retrieved November 20, 2012. ↑ "TEA/AECOM 2009 Global Attractions Report" (PDF). Themed Entertainment Association. 2009. Archived from the original (PDF) on June 2, 2010. Retrieved November 20, 2012. ↑ "TEA/AECOM 2010 Global Attractions Report" (PDF). Themed Entertainment Association. 2010. Archived from the original (PDF) on July 19, 2011. Retrieved November 20, 2012. ↑ "TEA/AECOM 2011 Global Attractions Report" (PDF). Themed Entertainment Association. 2011. Archived from the original (PDF) on October 18, 2015. Retrieved November 20, 2012. ↑ "TEA/AECOM 2014 Global Attractions Attendance Report Report" (PDF). Themed Entertainment Association. 2015. Retrieved June 4, 2015. ↑ "TEA/AECOM 2015 Global Attractions Attendance Report Report" (PDF). Themed Entertainment Association. 2016. Retrieved June 3, 2016.